I am Lale, writing from my small study in Istanbul while my colleagues are having a great time discovering Turkey. While I am jealous of the fun and the wonderful energy they are sharing, I am grateful they are here! With this entry, I want to share some of what is going on currently in Turkey. I hope this will give a context, perspective and insight to the reader. The big event of the past week was the three day visit of Pope Franciscus, 266th Pope and 8th President of the Vatican State. An army of journalists followed him while he was visiting Ankara and Istanbul. I have compiled information and photos below from international and national media. In Ankara, Pope Franciscus followed the standard protocol excepted from visiting heads of states. First, he visited the Mausoleum of Ataturk, then met with President Erdogan in his new lavish Presidential Palace. This made him the first official visitor in the palace. 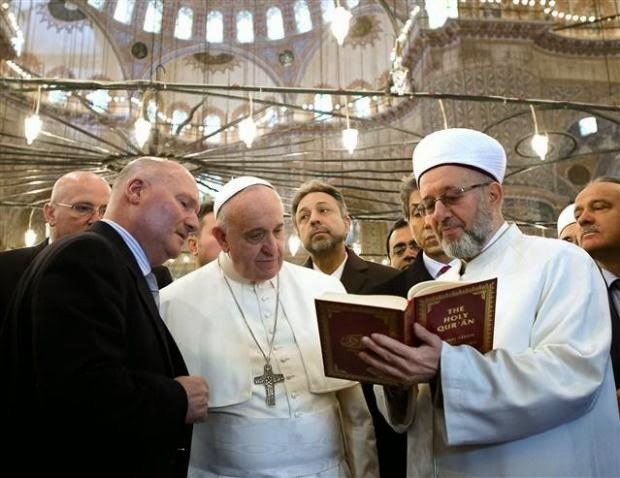 After meeting with Turkish President Recep Tayyip Erdogan, the Pope called for dialogue between faiths. The Pope also had made announcements during his flight to Ankara, expressing his gratitude towards the Turkish government for hosting nearly 2,000,000 refugees from Syria. 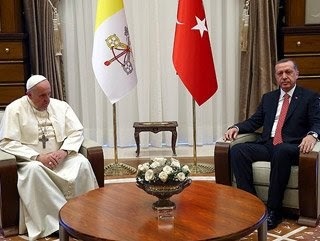 President Erdogan presented the Pope with a silver engraved copy of the 15th century declaration for freedom of religion towards Christians in Bosnia (by Ottoman Sultan, Mehmet II). 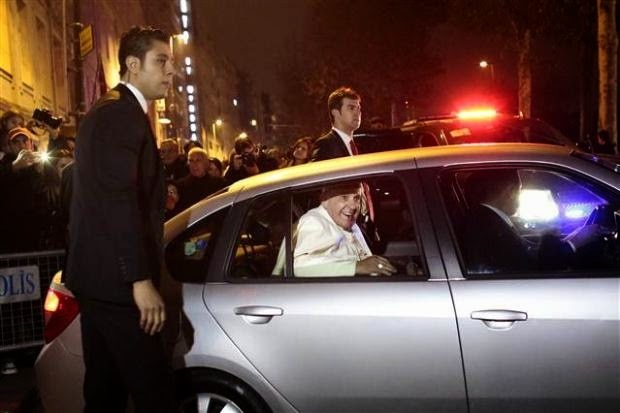 Among all, what made to the local headlines in Ankara was the determination of the Pope for using a modest vehicle, in spite of the fanfare and armoured vehicle prepared for him. 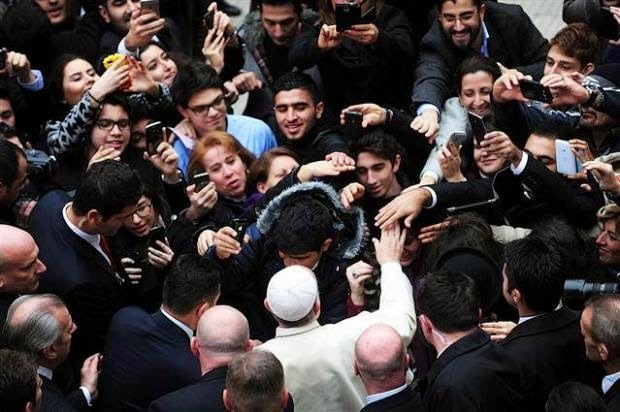 Last Wednesday, before his trip started, Pope himself had announced the upcoming trip saying that he would conduct an Apostolic visit to Turkey, and invited all to say a prayer that his visit triggers a peace and mutual understanding among religions and Turks. Visit of Pope was timed to correspond with the Feast day of Saint Andrew, brother of St. Peter, founder of the Apostolic Church of Constantinople. Current head of the Apostolic Church of Constantinople is Patriarch Bartholomew, he is considered a successor of Saint Andrew. 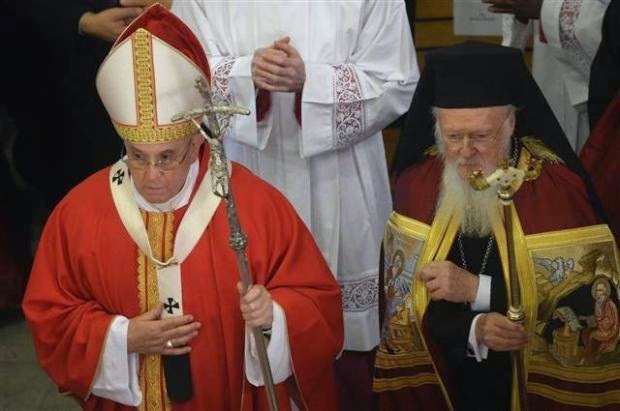 Pope Franciscus attended the Divine Liturgy at the Cathedral, exchanged the kiss of peace with Patriarch Bartholomew, a symbol of reconciliation and love, and the Lord’s Prayer was read by Pope Francis in Latin. 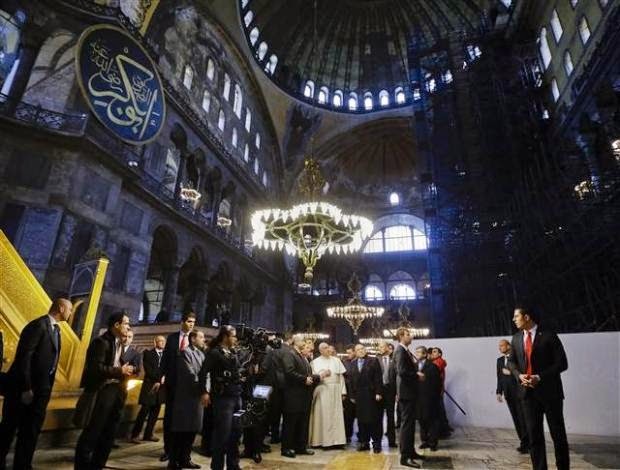 Pope Franciscus also visited the iconic land marks of Istanbul. 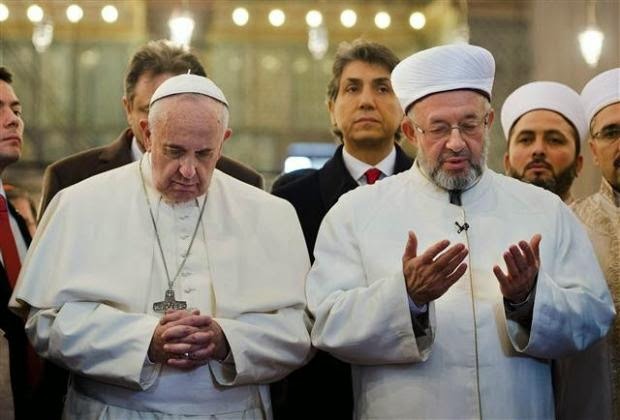 In the Blue Mosque, the Pope with the Muftu of Istanbul on his side, faced Mecca, tied his hands in reflection as a dua was performed by the latter. This very thoughtful gesture is considered a reconciliation between Islam and Christianity, though a Vatican official said the gesture was a silent adoration but not performance of prayer. Same gesture had been performed by Pope Benedictus eight years ago. 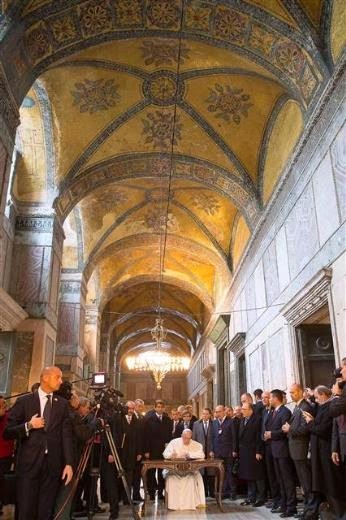 Pope Franciscus also visited Hagia Sophia, master piece of Byzantine architecture and the oldest standing great Cathedral. Currently a museum today, the building had been the most important Orthodox cathedral for about a thousand years before it was converted and used as a mosque by the Ottomans for five hundred years. Multi-purpose visit of Pope is also considered a step forward in attempts of reuniting the Catholic and Orthodox Churches which had got separated in 1054. The excommunication was mutually lifted in 1964 in Jerusalem by Patriarch Athenagoras I and Pope Paul VI, hence starting the dialogue that halted for centuries. While the Pope addressed the Patriarch as “brother”, Patriarch Barthomlemew had attended the inauguration mass of Pope Franciscus in March 2013 in Vatican, a first since 1054. 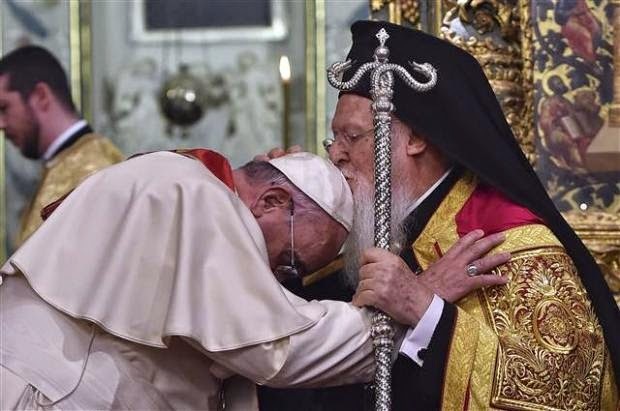 The Pope did not neglect touching base with other social leaders and invited some to the Holy Masses held at the Greek Orthodox Catherdal and Saint Spirit Cathedral, he also paid an unplanned visit to the Armenian Patriarch Mesrob Mutafyan who has been hospitalized due to dementia.